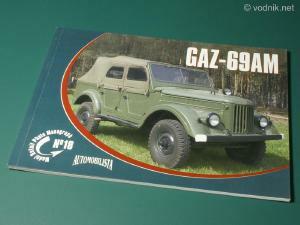 GAZ-69AM monograph is 18th book in the Model Detail Photo Monograph by Rossagraph company from Poland. The soft cover book is a bi-lingual release with al the text printed in both Polish and English. It contains 48 pages, 155 mm x 215 mm in size. The book starts with a table containing car specifications and a couple paragraphs long history of the vehicle, including a list of various variants produced. Two black and white historical photos of Polish army GAZ equipped with 12.7mm DSzK machine gun are printed next. Pictures were probably taken in 1960s. On following pages are photos of a very well preserved GAZ-69AM. These start with a series of general views and then we get a large number of pictures showing all the details of the car. Exterior, interior, engine and suspension details were photographed. Often the same part is shown from various angles to reveal all its features. Pictures are accompanied by captions in two languages. The English translation of text is a bit awkward in places, but it should be comprehensible and the value of the book is in photographs anyway. There is several good quality b&w and color drawings from technical manuals included. Majority of photos are printed in full color, but there are also some black and white pictures in the book. In total book contains 67 color and 30 b&w photos plus six illustrations. On some pictures we can see parts, which are not original GAZ ones, but each time it is clearly indicated in picture captions. First pages contain specifications table and a history of GAZ-69. Historical photos of GAZ in Polish Army. Some color drawings from the GAZ technical manual are included. The book is highly recommended to all modelers planning to build a GAZ-69 model, like resin ones available from Armo in 1/35 and 1/72 scales.